Occupational Therapy might sound like the kind of therapy you would need after a work related injury, but actually the word Occupational refers to anything that “Occupies” someone in their daily living. It was long ago discovered that when the body and mind are enjoyably occupied healing and growth occur more quickly and naturally. Children naturally occupy their time with play, and social engagement which serves as the foundation for their development. Using play experiences designed to motivate the children while socially engaging them in skills that take them to the next level, allows Danni Verona’s therapy to be a place where kids love to come. As a therapist for over 23 years Danni has worked with a wide variety of children with different learning and movement skill levels. Using equipment that stimulates the development of core strength and coordination, Danni is able to support the children to develop the skills needed to successfully engage in their environments at home and at school. 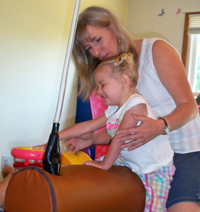 As a Pediatric Occupational Therapist, Danni provides direct therapy in a private clinic located in West Linn, Oregon. Families are welcomed into a quiet, personal atmosphere where the swings, balls, trampoline and toys offer the sensory input that the body and brain need to enhance the children’s learning. Danni uses Sensory Integration strategies, Motor Learning treatment techniques, and Relationship-Based brain development interventions to take her clients to their next level. Parents and family members are usually part of the therapy interaction so that everyone understands and can practice the techniques and strategies discovered and used in therapy. If you feel like your child needs additional support and intervention to better meet the demands of their daily lives, or if your just concerned that your son or daughter seems a little behind their peers please contact Danni for a phone consultation to see if Occupational Therapy might be right for you.